For people who are not familiar with the title, it is Finger Millet Flour banana Aebleskiver!! How many names we have for one kind of dish. The pan used to make this is called gundupongal plate in certain parts of karantaka, appe in some, paddu pan in some and paniyaram chetti in Tamil. I make a quick breakfast using this pan sometimes. It can be left over dosa batter or idly batter or sometimes the mixture of some of the flours and sugar poured in this pan. When Madhuram of Egglesscooking.com announced JFI - Ragi event, I was kind of disappointed since no body in my place likes Ragi. I make traditional karantaka dishes like Ragi Mudde, Ragi Rotti, Ragi dosa with it, but this being a dark flour, kids don't even want to try let alone like it. I had some ragi flour on hand and I modified my quick paniyaram recipe to use ragi flour and guess what, my kids ate them. Milk/ soy milk/water - 1/2 - 3/4 cup depending on how big the banana is and how ripe it is.Start with 1/2 cup and add more if needed. Cardamom - 4 pods powdered. In a large bowl, combine flours, cardamom powder, salt and baking soda. Stir. In another bowl, mash the banana, add sugar and milk/water/soy milk to it. Mix/beat well. Now add the dry ingredients to the wet and stir till incorporated. Add more liquid if needed. 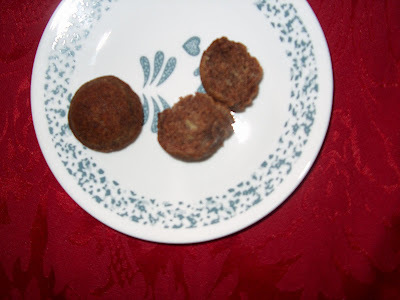 Don't worry about mixing well, since these are baked differently, over mixing will not result in tough product. Place the paniyaram pan/Aebleskiver pan on the stove and when hot, add about 1/2 tsp of oil in each (You might need less if you have a non-stick pan). Pour batter into the molds and cover and cook till the batter has set on the top. This is very important since ragi being gluten free is hard to manage. Once it is set, turn them over gently to cook on the other side. For the above proportions, I got 25 paniyarams of the size shown in the picture. Serve warm. Left overs can be warmed and served. I am sending this as an entry to Madhuram's - JFI Ragi event and to Srivalli's Kid's Delight - Wholesome Breakfast event. That's a nice idea Champa. 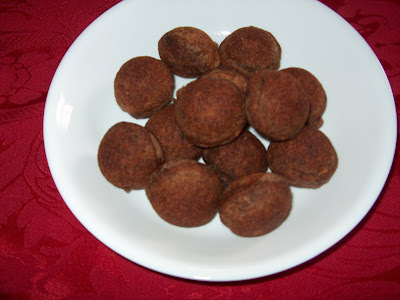 I also feel that ragi is not liked by many because of its color. This includes me too. Thank you for sending it to the event. I think I read in DK's blog that whole ragi is not available in US because of some law. It should not be imported or something. So have to go with the flour only. Fortunately we find it here in Canada in almost all the Indian grocery stores. Such a delicious ragi paniyaram, quite a healthy dish.. Thank you all for leaving a comment.